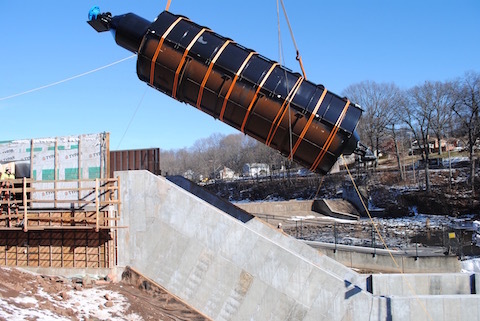 The first Archimedes Screw Generator (ASG) in the United States was craned into place in Meriden, Connecticut on December 19 and 20, 2016. The 20-ton screw and its generator system were lowered into position in the concrete trough. Mobilized for construction in September, the site was built throughout the autumn months with the sluiceway, powerhouse and screw trough all completed to accept the machinery in December. The Hanover Pond site will continue development for expected operation in the first quarter of 2017.